This is a guest-post by Andrea Crosta, co-Founder and Executive Director of Elephant Action League (EAL). The Elephant Action League (EAL) is appreciative of this opportunity to justify our findings on al-Shabaab’s involvement in the ivory trade and our decision to not share certain details gleaned from confidential sources due to security and confidentiality reasons. The professional investigative team that conducted the investigation – including myself – considers the safety of our sources nonnegotiable. As such EAL will not release sensitive details until our sources are safe. However, we hope that more information supporting our work will be published in the coming months. The figures presented in our 2013 report, Africa’s White Gold of Jihad: al-Shabaab and Conflict Ivory, are based on an investigation into the potential role of al-Shabaab in the trafficking of ivory conducted between 2011 and 2012. At the time, African governments, international governmental organizations, and law enforcement agencies were apathetic and often unaware of the magnitude of elephant poaching and the large quantities of ivory trafficked through East Africa. Especially prominent was the port of Mombasa, through which an estimated 188,170 kg of ivory was smuggled between 2009 and 2015, as outlined by our newly released report (based on an estimated 10% seizure rate). In Tanzania, between 2009 and 2014, over 85,000 elephants have been poached, which is equal to roughly 200 tons of ivory smuggled every year from Tanzania alone, often through Kenya. In that period, we began picking up information about large quantities of ivory being trafficked by Somalis, either through Somalia or directly from Kenya. The fact that Somalis were involved in ivory trafficking was not new, as they have been historically linked to elephant poaching. What was unique was the alleged involvement of al-Shabaab, as also reported by Jeffrey Gettleman in an article for the New York Times in September 2012. Over the subsequent eighteen months, thanks to personal introductions by trusted individuals coming from the same clans and sub-clans (crucial in the Somali culture), the investigators met several Somali traffickers and businessmen who were doing businesses with al-Shabaab who confirmed and explained how the terrorist organization had positioned itself as an important middleman in the trafficking of ivory, making hundreds of thousands of dollars every month through their direct involvement in this illicit activity. At that time al-Shabaab still controlled vital points on the border with Kenya, as well as key ports in Somalia such as Kismayo and Merca. EAL has never denied the importance of other far more substantial sources of profit for al-Shabaab - such as charcoal - but through this investigation, we simply exposed an important regional player that contributed significantly to ivory trafficking. Terrorism and terrorist organizations do not drive elephant poaching and ivory trafficking, but they certainly do play a role. 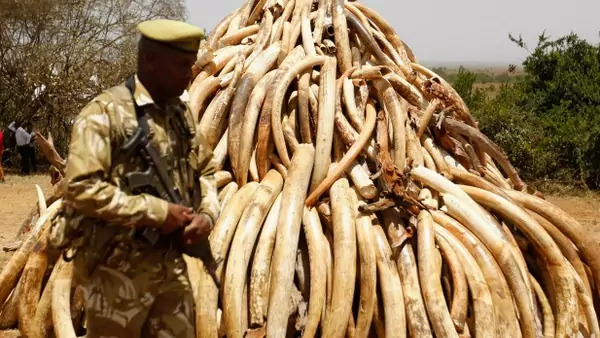 The magnitude of al-Shabaab involvement in the illegal ivory trade at the moment is unknown although occasionally through our on-going field activities, we receive information about ivory continuing to be smuggled through Somalia by various entities.